So here it is... This one-point perspective unit is a project I have been waiting to share with you for months. I will be presenting at the AOE online conference in less than a week. One of the topics I will cover at Art Ed Now this year will be flipping the classroom as an elementary (or really any grade level) teacher. For those of you who are unfamiliar with flipping the classroom, it simply means to record your lessons ahead of time, well that's the short answer and the way I'm using it in this post. I will be talking about the 'how to' and why I flip and be introducing this amazing lesson to you during the presentation. There is still time to join in if you are interested (click here). This spring I tried a new type of teaching. I wanted students to be able to learn at their own pace, and I also wanted to give students choice. In creating a lesson this way, I did so much more. 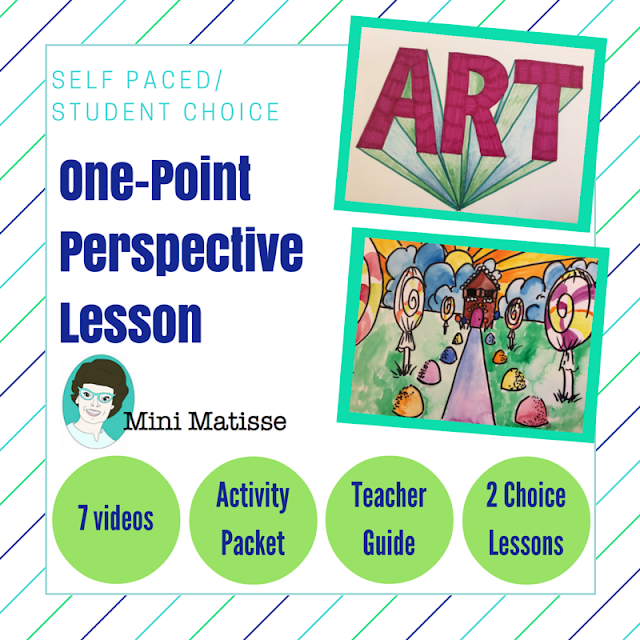 I was able to differentiate, students who got one point perspective raced ahead and challenged themselves with a higher skilled choice lesson. Students who needed to work slower were able to do so. They were able to choose a final project that would allow them to feel successful. Best of all, I was able to give a formative assessment to EVERY student, several times during this lesson and not be overwhelmed. NO JOKE, I felt like I won the lottery with this one. It's always good to read blog posts, but allow me to explain a little more in the video below. In this lesson I give 5 'flipped' lessons instructing how to create one-point perspective. I have also included two choice lessons. 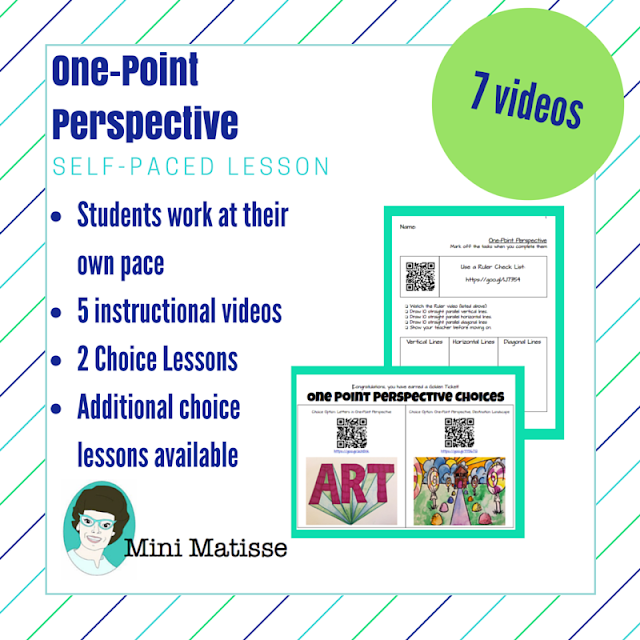 Per design, after students have mastered the skill of one-point perspective, they can scan to learn how to create one of two lessons. 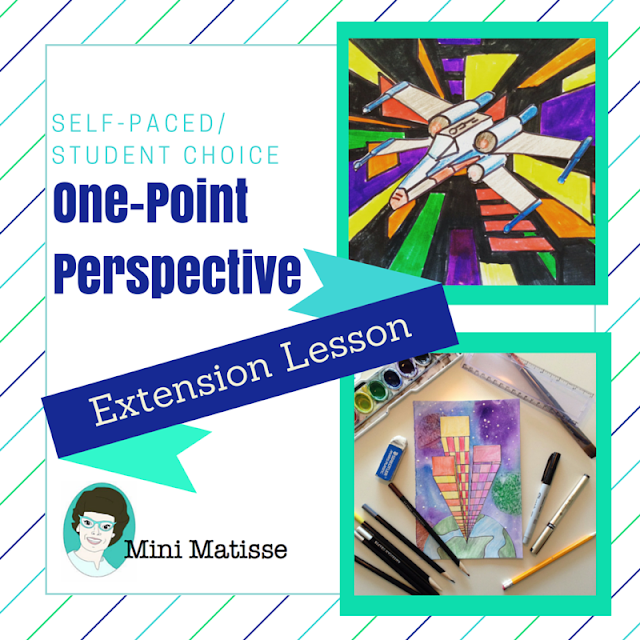 I will be creating more 'extensions' so students can have more choice, but my hope is that you will be inspired to create your own. Recording your own lessons or providing other choices and perhaps project samples to your students. 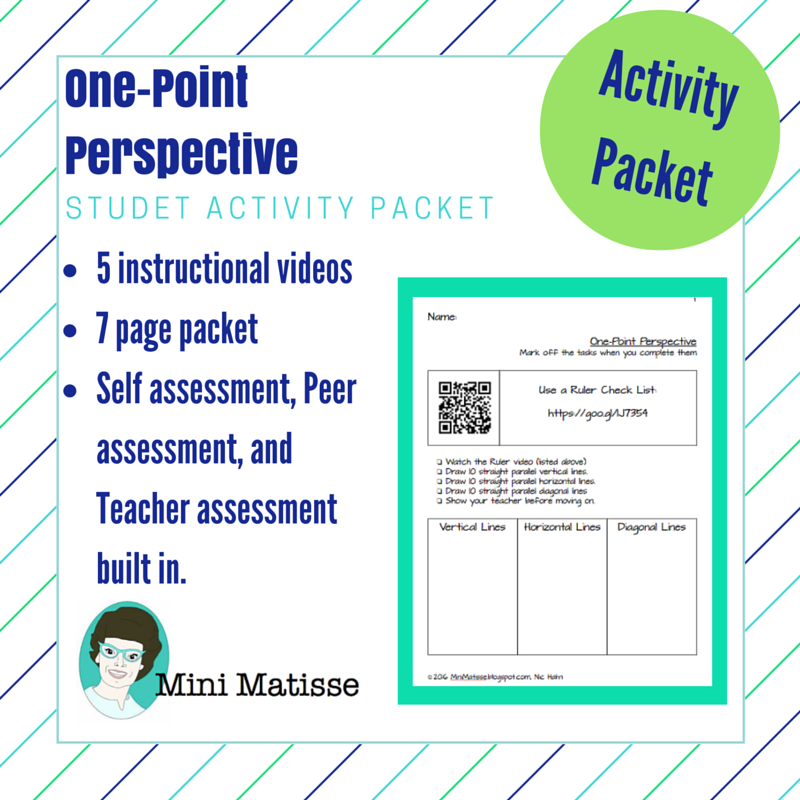 In this TpT lesson I have a seven page activity packet. This is where the students will scan the lessons, do the activity, and show it to you for confirmation that they are going in the right direction. Students are learning on their own... you're not instructing. They are problem solving and finding confidence using this sheet and working towards the goal of the 'Golden Ticket'... in other words choice, and that is HIGHLY motivating to students. 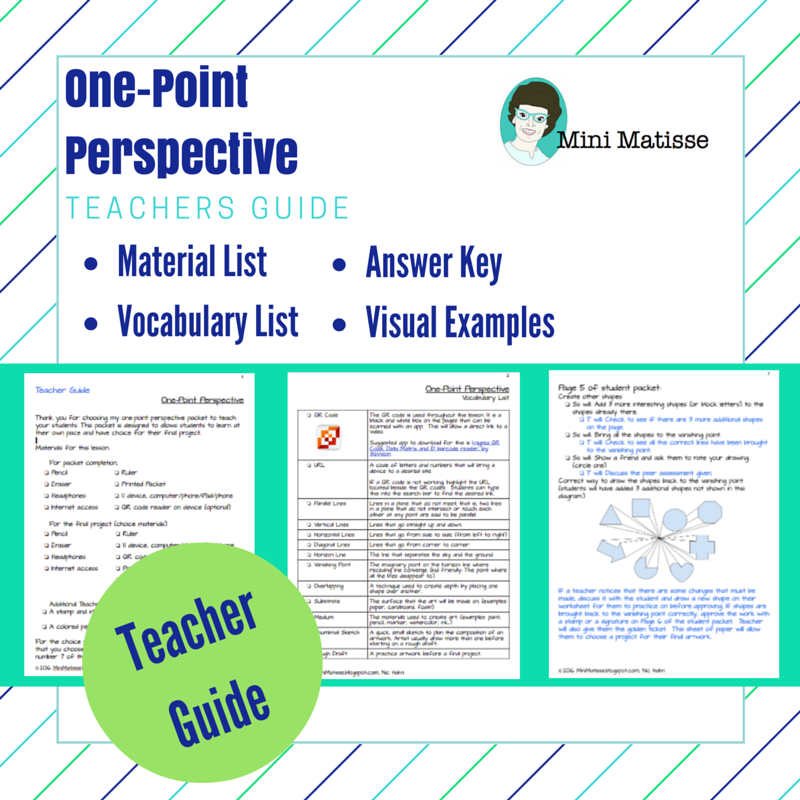 Another key packet in this TpT lesson is the teacher guide. This teacher guide allow ANYONE to be able to facilitate this lesson. So why does an art teacher need this?? I have talked with Visual Art teachers who have explained that they feel comfortable teaching clay, painting, or art history, but one-point... is challenging. I get it. I find it hard to teach sculpture but perspective is something I can do, and have had lot's of practice with. I wanted to make this lesson so that ANYONE can teach it, no experience needed. This could be beneficial for home school families, homeroom teachers who want to support their math curriculum with visual arts, a substitute coming in to teach your art classroom... really anyone can use this teachers guide and know how to be the support that is required in this lesson. I also made the teacher guide to explain to a more experience teacher, what the flow is, and why. It's a critical part to this TpT lesson. I have put my heart into this lesson and found it to be so successful that I can't wait to have others use it in their classroom. Click here to visit the TpT site. This is so awesome! I am wondering how do you manage devices in your classroom? Do students bring their own, do they share, or do you have a class set? Also do you have them all wear headphones? Great question, I'll post about it. You're not the first person to ask. I am really feeling the pull towards choice based instruction and the flipped classroom. I was curious to know if you could recommend any resources on what you found was helpful in learning and implementing the concept of the flipped classroom? Thanks for all the amazing work you do to inspire students and teachers! I love this lesson, but it really is a technology lesson. This lesson might be good for you to see how I break it down, You could also still run the class all together but just project the videos included in the lesson. Just some thoughts.